Free Shipping Included! 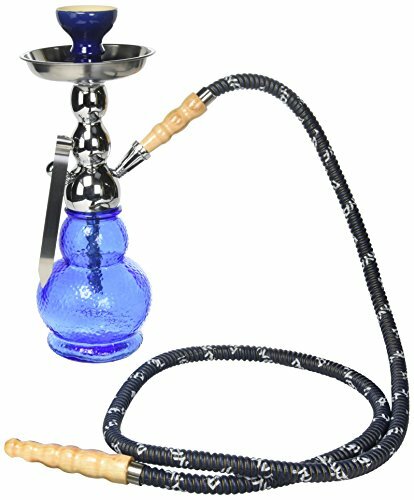 MYA SARAY GELATO MEZZO 18'' COMPLETE HOOKAH SET: Portable Modern Hookahs with multi hose capability from a Single Hose shisha pipe to 2 Hose narguile pipes with hard carrying case (Blue Hookah) by Mya Saray at Serious Jones. MPN: B073HRM1HC. Hurry! Limited time offer. Offer valid only while supplies last. Designed to resemble an ice cream scoop, this beautiful modern hookah the mya gelato mezzo by mya saray can sure churn out some tasty flavored smoke. Designed to resemble an ice cream scoop, this beautiful modern hookah the mya gelato mezzo by mya saray can sure churn out some tasty flavored smoke. This shisha pipe has a bohemian-style glass base with a layered appearance and a sturdy stem that unscrews into 2 pieces for easy cleaning and storage. These unique hookah pipes are stored in a hard style carrying case making them portable for easy travel and storage and come as a complete hookah set including premium hookah tongs, porcelain bowl, rubber grommets, 74" washable hose (solid matching color), and setup instructions. This hookah is stored along with its accessories in a sturdy, hard style carrying case. The gelato mezzo has multi hose capability and may be converted from a single hose hookah into a 2 hose hookah by utilizing stem adapters that contain the auto-seal system. The auto seal system eliminates the need to use rubber stoppers and flip caps when there are multiple users smoking the hookah. This narguile may be used for both decorative and smoking pleasures, providing entertainment for years to come. If you have any questions about this product by Mya Saray, contact us by completing and submitting the form below. If you are looking for a specif part number, please include it with your message. KHALIL MAMOON PRINCE 38" COMPLETE HOOKAH SET: Single Hose shisha pipe. Handmade Egyptian Narguile Pipes. These are Traditional Heavy Metal Hookahs.